When a person speaks into their mobile device or types certain keywords into a search engine to find products and services, your on-page SEO (search engine optimization) is one of the many factors that determines whether that person will find your website in the search results. 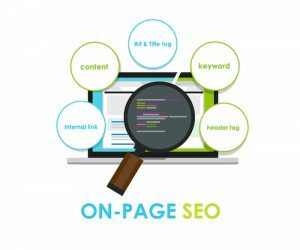 There are several places on each page of your small business website where your focus keyword must be included in order to improve your search engine results. Content – First and foremost, your content needs to appeal to your audience and not search engines. However, each page of your website should include your keyword at least a couple of times. Best practice is to include the keyword in the first paragraph of the page, and to sprinkle it throughout the remainder of the content; it is a fine line to walk between enticing search engines and keeping your readers engaged. Title tag – This SEO title is the second most important place to include your keywords, behind the content of the page. Always include your keyword in the SEO title. Image alt text – If you have any images on a page, be sure to enter your keyword for that page in the alt text field for the image. This step is another way to be sure that the page’s contents are identified as being related to the keyword. URL – Whenever possible, include the keyword in the page’s URL. Properly labeled URLs are a very strong indicator to search engines that a page includes information about a given topic. Meta Tag Description – We’ve found it helpful to add the focus keyword in the Meta tag description. If you’re using WordPress, the Yoast SEO plugin will make this step easy to accomplish. Headers – To make your content easier to read, each page should have an H1 tag, and at least a couple of H2 tags. These tags should include your focus keyword where it makes sense. After completing your keyword research, keyword mapping will be your next step. Each page of content must have a single focus keyword. It’s certainly okay (and recommended) to use a secondary keyword in your SEO title and content itself, but there should be one and only one focus keyword for each page of the site. The first sentence of each paragraph should clearly state a main topic, and subsequent sentences should expand upon that topic. Remember to use the keyword throughout, but only where it sounds natural to your readers. Be specific, avoid fluff and jargon, and assert your expertise on the subject. Fresh content is another ingredient for on-page SEO success. Posting new, original, engaging content to your website at least on a weekly basis is a great way to attract the attention of the search engines. Plus, it helps build your readership if visitors discover useful and interesting content on your site each week. Does your site load quickly on a desktop and a mobile phone? You can analyze your website’s speed and mobile friendliness by using this brand new Google testing tool. If your site is not performing well, you can read up on the factors that are slowing it down and have your webmaster take a look. You could always contact us if you need assistance in making your small business website the fastest on the block. Search engines consider many factors when determining the results of each individual query. There are lots of behind-the-scenes factors on a typical website that the average person doesn’t even know about, let alone consider when building or maintaining a basic website. To ensure that your on-page SEO is optimized, request a complimentary SEO analysis. Or, you may give us a call at (770) 580-3736 for more information.